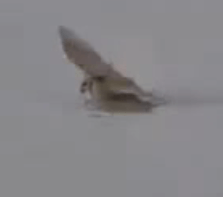 Is This An Owl Swimming? I Thought I’ve Seen It All!!!! When I first saw this video, I thought to myself, “Damn! I didn’t know that an Owl can swim”! But after looking at the video a few time, the though came to mind that maybe the Owl fell into the water and is unable to get out. I did a little research and found out that this owl was forced down into Lake Michigan by two Peregrine Falcons, and it swam it’s way back to shore. I also found out that the “Snowy Owl”, when it’s young and unable to fly yet, will swim across a body of water if it needs to.